The CDH-35 model has been discontinued. Please see the CDH221and CDH222 as possible alternatives or contact our Flow Engineering Department. 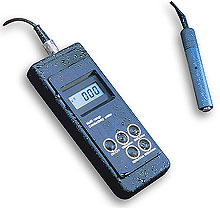 This water-resistant, multi-range conductivity meter is recommended whenever measurements must be taken in the field. Even adverse weather conditions will not affect performance, as the housing resists both moisture and dust. The CDH-35 is also one of the most versatile conductivity meters available, capable of measuring samples from deionized water to brine, using the same probe without recalibration. More accurate than amperometric probes, the 4-ring potentiometric probe is made of stainless steel for maximum protection in rugged conditions. The meter also features automatic temperature compensation and a Battery Error Preventive System (BEPS) to alert the user when low batteries might affect results.